On the 20th of September, The South African National Biodiversity Institute (SANBI) hosted its 4th Annual Biodiversity Science and Policy Advice (BS&PA) Symposium at Kirstenbosch National Botanical Garden. 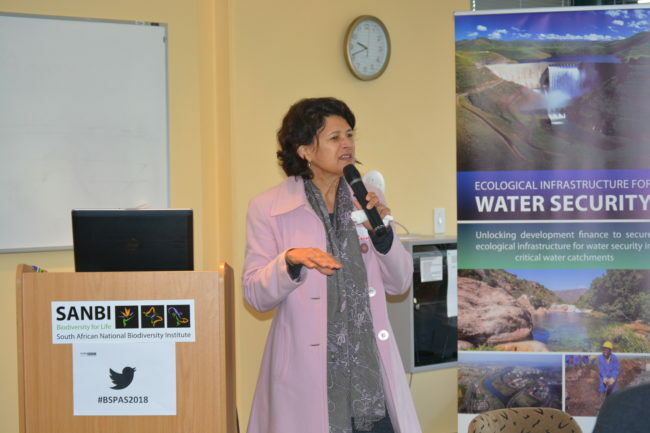 The symposium was intended for SANBI staff, as this year’s event theme was based on the 2017 Biodiversity Science and Policy Advice External Review. Head of the Biodiversity Science and Policy Advice Branch Ms Carmel Mbizvo, gave an overview of the 2017 BS&PA External Review process. She said “SANBI has, over the last decade since its establishment, produced a substantial and evolving body of work towards fulfilling its mandate”. Ms Mbizvo emphasised that the External Review adopted a qualitative approach which included self-assessments, as well as individual and focus group interviews with internal and external stakeholders. Quality, relevance and impact of BS&PA including SANBI’s contribution towards national government priorities. SANBI’s response to the changing socio-economic environment and to the challenges and opportunities created by such changes. SANBI’s role in developing, retaining and transforming its (internal) human capital. Assessment as to whether SANBI is equipped in terms of resources, core competencies and capabilities to effectively deliver on its mandate. Make recommendations regarding SANBI’s future strategic direction and operational execution of its mandate. How effectively does SANBI operate at the science policy interface and does it meet DEA’s expectations in terms of provision of science evidence and policy advice? Four SANBI Chief Directors then set the scene of the day by sharing key findings and recommendations that emerged from the External Review. Thereafter the organisers of the event introduced a world café method, which is a structured conversational process for knowledge sharing. Participants were split into groups, wherein each group had a specific topic to address. Individuals had to ensure they switch and participate at all groups. Identity and Mandate – SANBI is found to be a well-functioning organisation, executing its mandate in a responsible and commendable way. However there is interesting debate within SANBI, due to its broad role and historically ever-expanding mandate, regarding whether it is primarily a research organisation, an information broker, a policy advice body, a funding agency, or a development implementation agency, or some combination of these roles. Resourcing and Partnerships – The core funding for SANBI to meet its NEMBA-required mandate is inadequate, and innovative solutions are needed to ensure that SANBI can meet its mandated work. Human Capital Development – SANBI has done an outstanding job at generating human capacity for the biodiversity sector, but needs to continue to invest in meeting its own needs, especially in core respects like taxonomy, bioinformatics and policy analysis. SANBI Research Strategy – SANBI research is respected nationally and internationally, partly on the basis of investments made over the past century, and a clear strategy for research is needed going forward so that SANBI focuses its research where there is the greatest need in the sector. Panel discussion: Anisha Dayaram, Les Powrie, Shahieda Davids (host) and Sebataolo Rahlao. Discussions and engagements which focused on ideas, actions, solutions and challenges facilitated by table hosts were later shared in plenary to all present. The event ended with an open panel discussion that allowed long-term and newer SANBI staff to share their journey at SANBI with the audience, and reflect on their reasons for working at SANBI. The day and event proved to be highly productive and engaging, attracting nearly 80 SANBI staff. 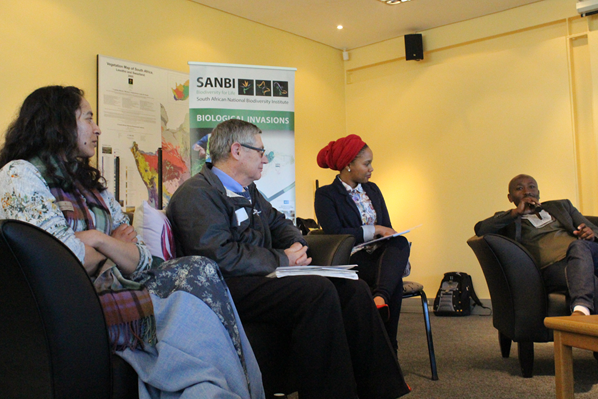 The symposium allowed for deeper discussion and understanding of the relationship between SANBI’s biodiversity science and policy advice and the full SANBI value chain. It also allowed for a purposeful and productive conversation about SANBI’s organisational role in the sector. “Having the external and internal review was wonderful. But taking this review further by openly gathering the thoughts and reflections from the people that invest their energy daily in fulfilling SANBI’s mandate was indicative of a healthy organisation that is not afraid to evaluate and evolve to become more effective at fulfilling its role” said SANBI’s Vegetation Scientist Anisha Dayaram. It is important that all staff are provided the opportunity to engage in organisational processes such as Reviews. All present were encouraged to continue with the discussion and engagements in their teams and directorates, as the strategic connections which emerged from the four focus areas will be used to feed into the broader Biodiversity Science and Policy Advice Branch matters for senior management to take forward. For more information about the Biodiversity Science and Policy Advice Symposium contact Shahieda Davids on S.Davids@sanbi.org.za.